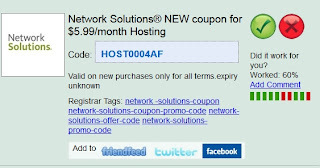 Network Solutions Offer Codes 2013 for all your online needs, from domain names, hosting, to renewal of your website. There are discount codes for you to redeem at the moment, such as SAVE70DAF for domain names at 70% off, HOST0004AF for hosting or WEBSITE1AF for websites. If you are like me trying to make some extra money with blogging, then a domain name for it is crucial, as advertisers often pick blogs with a domain name than a sub-domain name blogs. Personally, I also like it better because it sets my sites apart from others. 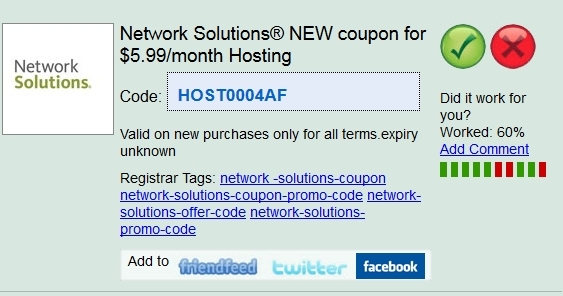 Click on the link in this post to go to Network Solutions and find out more about their offers. You can even find domain name for $1.99, which is way lower than what I paid for mine. "Live and learn" applies so well in this case! I will not be rich with my blogging, or dream to become the next big blogger, but I am happy sharing my photos, my thoughts, and occasional tips. My love for taking pictures of nature is more than enough to keep me contented while I have no work. If you have a love for writing, a website also would give you the best platform to display your work!